I’m not sure why, but every year someone asks about purple trees in San Diego. It seems that the color purple is one of most noticeable colors in the landscape. Perhaps as such a vibrant contrast to green, purple and it’s cousins, burgundy or maroon have always held a tremendous fascination as key players in any landscape. 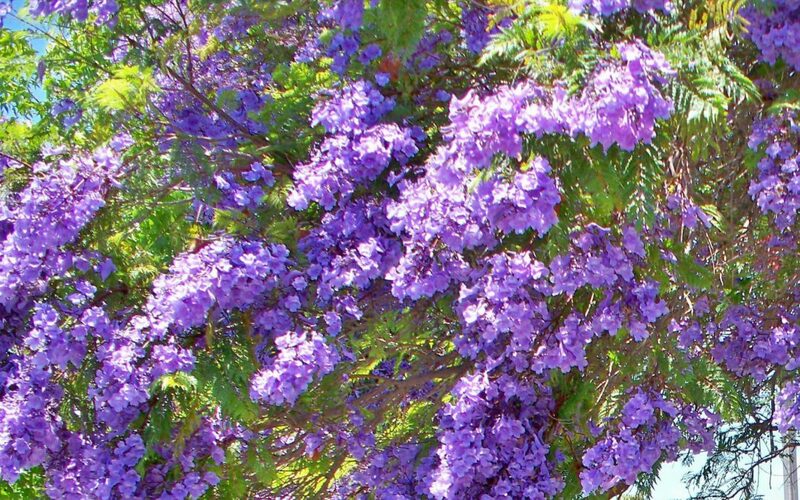 The most prolific, pleasing purple tree is of course the blooming Jacaranda Tree. Jacaranda mimosifolia, a native tree from Brazil. This tree is briefly deciduous or semi-evergreen, grows 25 to 40 feet tall with a oval headed habit. It’s leaves are fern-like and it will dazzle viewers with its outstanding display of blossoms late spring. One other minor point, the “J” is pronounced in Latin, therefore it is never a “hacaranda” tree with a Spanish translation of the letter “J”. Now the other main purple leafed tree really isn’t purple at all. 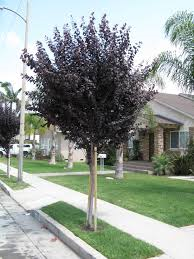 A Bronze Leaf Plum, Prunus ‘Krauter Vesuvius’, is the smaller purple (bronze) tree most commonly found in San Diego. This small tree grows roughly 18 feet tall and bears light pink flowers in the spring. It too, is deciduous. With an oval form, it is truly the darkest purple (bronze) flowering plum. Lastly, another tree often confused with the Bronze Leaf Plum, is the Caribbean Copper Tree. Euphorbia cotinifolia, can be a shrub or a small tree up to 18 feet tall. It is often grown as a multi trunk tree. 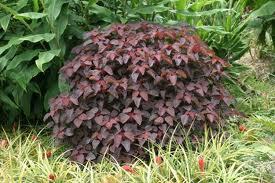 The most common cultivar is ‘Atropurpurea’ with a wine-red leaf color. Side by side the Caribbean Copper Tree is more a reddish hue compared to the deep bronze (purple) leaf of the Purple Leaf Plum. On the plus side, this Euphorbia is quite a bit more drought tolerant than the Purple Leaf Plum. Using these trees in the landscape always creates a stunning scene. These trees are best used as accents where they can be appreciated from a distance. Of course the Jacaranda Tree is often used as a street trees. And this does create quite a mess, especially if you decide to park your vehicle beneath them. Often, when using this deep purple element in a design, I’ll include a few other spots of similar color on a smaller scale, such as some form of New Zealand Flax in the same bronze color, or an ornamental grass. The use of these deep bronzy colors do seem to evoke a sensation when contrasted with other shades of green and even more prolific when set next to certain shades of blue green. So whatever your favorite color, Letz Design can offer a range of exciting possibilities with a multitude of choices of foliage and or bloom within the landscape. And we have the luxury of planting these highly visible trees at any time of year in San Diego. Contact me today to start enjoying your own Purple tree, or Pink, or Red, or……endless possibilities!